Swan Hills Goju Ryu Karate ended 2017 on a high note after intensive training and successful gradings. 20 members of Sensei Bob Allen’s dojo travelled to karate’s birthplace in Okinawa, Japan, joining students from across Australia to learn from masters Shigetoshi Seneha Sensei of Ryusyokai Karate-do and Takehiro Gaja Sensei of Matayoshi Kobudo (traditional Okinawan weaponry). 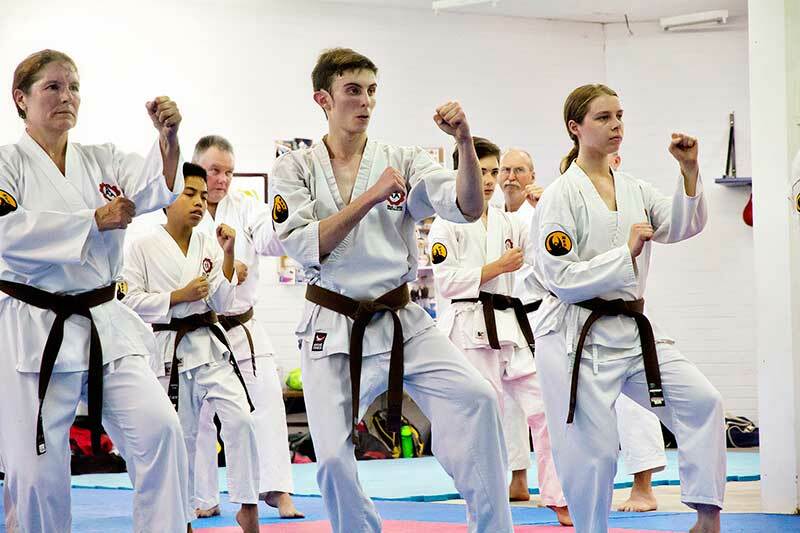 Several WA students and instructors achieved higher ranks, and senior students staying back to instruct classes at Swan Hills’ Midland and Mount Helena dojos were graded at home, their promotions certified in Okinawa by Seneha Sensei. Sensei Bob also graded, receiving higher ranking instructor levels in both karate and kobudo, along several of his students who assist under his guidance with training and coaching. Assistant instructors Ian Smith, Leo Spiccia and Wolf Konrad were promoted to 5th dan black belts. Damien Bell, instructor at Swan Hills Goju Ryu’s sister dojo in Bridgetown, received his 3rd dan. Tony Wray, Warren Hope, Lisa Skrypichayko, Pru and Beau Ruthofer also received 3rd dans, and Melinda Brezmen was promoted to 2nd dan. Hope and Skrypichayko also received black belts in kobudo. Back in WA the annual brown/black belt testing soon followed. Of all the students who participated, Ben McDonald (recently returned from Okinawa), Grace Sawyer, Michael Samirich and Philippa Jackson of the Bridgetown dojo were promoted to shodan (senior black belt), with new junior black belts also given to two younger students. Sensei Bob Allen is the WA head of Goju Ryu Australia. He was a referee at the state and national level for 21 years, and is one of the WA Karate Federation’s senior kata coaches. Sensei Bob teaches students of all ages at his Midland and Mount Helena dojos. For more information, please ring Bob on 0419 922 609 or email bob@swanhillsgojuryu.com.au.